Fondly referred to as “Fortnum’s” and located in Piccadilly, London, U.K., this company is an upmarket department store with outlets and stockists throughout the world. Established in 1707 by William Fortnum and Hugh Mason, they built their reputation on providing quality food, seeing rapid growth in the Victorian era. Ranging from basic to exotic provisions, Fortnum and Mason started as a grocery store but it grew over the centuries to become a trusted business all over the globe. Today, this company is privately owned by Wittington Investments Ltd. The Gentlemen’s department has also been added to the third floor of their headquarters and over the years, other departments have been added. Piccadilly is the location for their tea shop and various restaurants. William Fortnum took a post as Footman in Queen Anne’s household in 1705 and it was there when he met Hugh Mason. William was an ingenious entrepreneur and he came up with the idea of selling the Queen’s used candle wax for a profit. This was the beginning of their partnership, founding their business in Duke Street in 1707. Seeing as their store was on the path of travelers heading west from London, they decided to capitalize on selling portable provisions that could last throughout long journeys. It was 1738 when they invented the Scotch Egg, which is a hard-boiled egg cooked inside a breaded and fried sausage meatball. They opened a Post Office in 1794, providing letterboxes that were still operating in 1839, when the first General Post Office was founded. Fortnum and Mason began supplying soldiers with honey, spices and dried fruits on their way to conquer Napoleon in 1814 and in 1840 they built their new building in Piccadilly that was the first in the country to have plate glass windows lit by gas. In 1846, heir Richard Fortnum passed away and left a fortune for the staff. This company won a gold medal at the Great Exhibition in Hyde Park in 1851, for their offerings of luxury foods. Charles Dickens wrote about Fortnum and Mason’s hampers and lobster salad. In 1854, Queen Victoria requested an order of their beef tea to be sent to Miss Nightingale for the soldiers, due to the hospital scandal and bad treatment of soldiers at the time. Fortnum and Mason donated a sample of ‘Old Men’s Eyebrows’ China Tea to London’s Kew Gardens in 1872 and they introduced Mr. Heinz Baked Beans to Piccadilly in 1886. This company sent hampers to the imprisoned suffragettes in 1911 and in 1914 their hampers kept the British Officers going in Northern France. This company sent provisions to the first British Everest Expedition in 1922 and they opened a Sports department in 1930, with a mini ski-slope and slow-motion film, teaching their customers how to ski. This was soon followed by a contemporary decorating department, offering luxury rugs and murals in 1931. With King George the 5th’s Jubilee in 1935 attracting visitors from all over the British Empire, Fortnum and Mason imported special foods for various visitors, including Hindu and Muslim meals. In 1937, they had hand-painted china crafted for them by Spode and in 1940 they created Active Service chocolate for the military. Their first female director was appointed to the board in 1954 and in 1955 they opened a beautiful restaurant called The Fountain. In 1964 they revealed their landmark clock on the Piccadilly frontage, with bells sourced from the same foundry as Big Ben’s. In 1984 they helped spread the charitable message from the Band Aid Appeal by selling the “Do they know it’s Christmas” record. Fortnum and Mason launched their website in 1999, taking their business to the world, offering hampers and gifts, with over 800 products. The Piccadilly store was decorated with their famous beehive entrances in 2008 and Queen Elizabeth formally opened their Diamond Jubilee Tea Salon in 2012, soon followed by their long-awaited 2nd store opening in St. Pancras in 2013 and a store at Heathrow airport in 2014. Considered experts after selling tea and provisions for more than 300 years, this esteemed company travels the globe to source the finest ingredients for their exclusive blends. 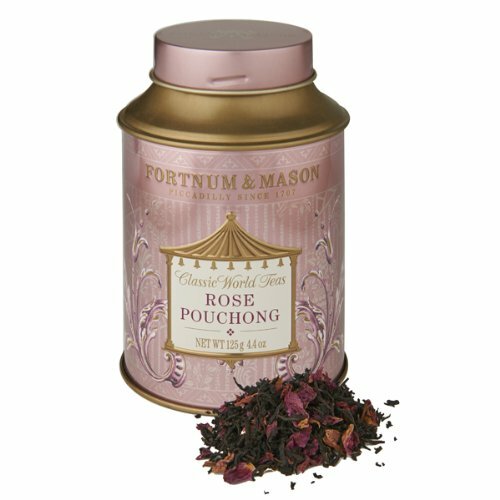 Malty Assam tea is blended with the flowery notes of Pekoe to create a classic, traditional cup. 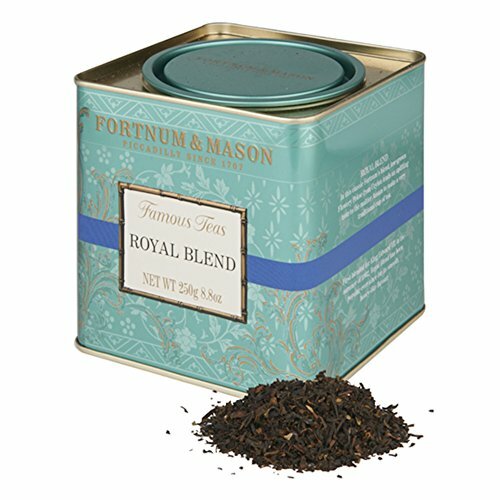 First crafted for King Edward VII in 1902, Fortnum and Mason’s Royal Blend is popular for its smooth, honeyed flavor and is considered to be an upgrade from regular morning brews. This special Chinese Black tea is a fine grade Maofeng Keenum blend infused with rose petals, making it a fragrant beverage that is delicate and subtle, pairing nicely with fresh fish, gamey meats and milk chocolate. 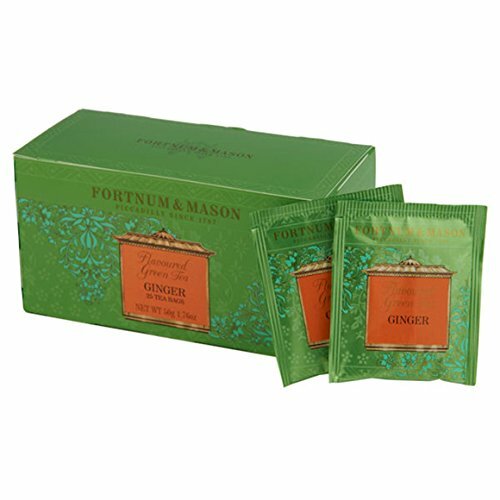 Carefully selected green tea sourced from China is blended with zesty ginger to make a stimulating cup that is warm and refreshing. A delightful tea that can be enjoyed any time of the day, hot or iced, you will appreciate the lightness of the green tea combined with the powerful punch of fresh ginger. Some might call it a waste of tea, but the ginger is also nice if you plan on taking a green tea bath. Fortnum and Mason has a long history of providing luxury provisions to customers ranging from regular people and soldiers to the upper classes and royalty, while maintaining a passion for charity and quality. They also offer bespoke hampers and gift cards along with their customary services that make them a respected company steeped in centuries’ old traditions.